In December 2017, Carmen Villar joined Merck as the Vice President, Sustainable Impact in the Policy, Communications and Population Health (PCPH) organization. In this new role, Carmen has responsibility for the Corporate Responsibility, Merck for Mothers and Population Health teams, with a focus on the intersection of social responsibility and business impact. Prior to joining Merck, Carmen had a distinguished career at the Centers for Disease Control and Prevention (CDC), where she helped lead the agency through both the West African Ebola emergency response in 2014 and the Zika emergency response in 2016. During her seven-year tenure as Chief of Staff, Carmen worked to ensure programs and staff were having the maximum impact on preventing disease and improving poor health outcomes around the world. Her leadership was critical in providing coordination across agency and with other US government counterparts and earned her the honor of the Presidential Meritorious Rank Award. 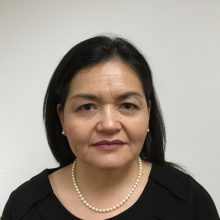 Ms. Villar worked in both Nigeria and Zambia, providing leadership and oversight to CDC’s programs as part of the President’s Emergency Plan for AIDS Relief (PEPFAR). She worked with Ministries of Health, NGOs and the US interagency team to ensure delivery of treatment, care, and support services for people affected by HIV/AIDS. As a key health advisor to the US Ambassadors in Nigeria and Zambia, she also provided expert advice in critical public health areas such as Polio and Tuberculosis, while overseeing program budgets of hundreds of millions of dollars. Carmen started in government as a Presidential Management Fellow focusing on policy and program planning for HIV, STD, and TB prevention. She has worked closely with state and local health departments to implement public health preparedness and HIV prevention programs. Carmen has also overseen multi-site domestic and international HIV research in the areas of drug use, prevention of mother to child treatment, and vaccines. Prior to joining CDC, Carmen was the Policy Affairs Coordinator at the AIDS Healthcare Foundation and also served as a Legislative Aide in the California Assembly. In addition, her work in hospice counseling and hospital discharge planning has provided unique insights into front line patient care. Carmen holds a Master’s in Social Welfare, with a concentration in health, from UC Berkeley and a Bachelor’s in Anthropology from UC Berkeley.